Our aim is to recognize and respect the need of normal physical contact and expressive behavior of all our residents. We will ensure and enable each resident to lead his or her life to the fullest potential in all aspects such as physically, emotionally and intellectually. Our staff will be aware of religious, ethnic and cultural needs in allowing reasonable choices in the everyday lives of our residents. We will endeavor to promote esteem and maintain respect of each resident’s experiences and life history. We will always remember that this is the resident’s home at all times and thrive to allow them the freedom to be individual and encourage them to have an awareness of other individuals around them. Rest assured that all information concerning all our residents will be treated with the greatest respect and access to this information will be limited to only those who need to know. Residents will be allowed to make their own choices and take reasonable and informed risks providing they do not threaten their own safety or the safety of others in the home. All medical intervention and personal care will take place in the privacy of the residents own room. Self respect and privacy of all our residents will be maintained to the fullest extent at all times. 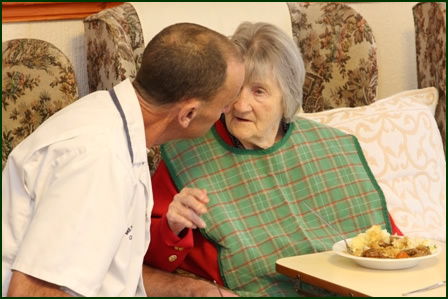 We believe that entering a care home should be viewed as an extension of one’s normal life and our staff will do their utmost to ensure that all new residents settle into Meadows Court and are able to maintain their independence and develop their full potential as much as possible. In a homely atmosphere, Meadows Court provides a high quality of individualized care based on a philosophy of understanding by all the care team that the residents shall always have the right to privacy and shall be treated with the utmost respect and dignity. The total caring concept is planned in such a way as to encompass the physical, emotional, social and spiritual needs of the residents at all times. 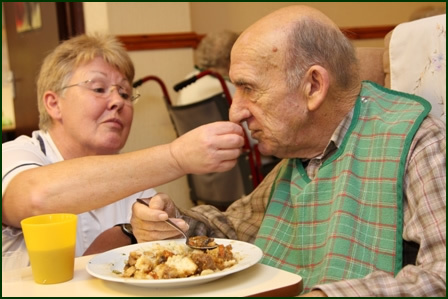 Our aim is to give all our Residents a lifestyle that is safe, secure, comfortable and also varied where one can make new friends whilst maintaining contact with their loved ones. We are also committed to keeping all our residents stimulated and motivated through promotion of the core values and provision of adequate and appropriate social activities. We pride ourselves in being a home from home, where residents, their families and friends can spend quality time together in a calm and peaceful environment. Meadows Court has a friendly homely atmosphere making everyone feel welcome from the moment of arrival. We monitor quality of the service we provide by regular meetings and informal interviews with our residents and or their family and friends, always encouraging open comments and opinions. Quality / Service questionnaires are regularly sent out to friends / relatives of our residents and to all professionals who visit the home, GPs, Social Workers, District Nurses, CQC Inspector etc. The valuable information gathered from these feedbacks puts us in a position to improve on any aspect that these responses indicate, should we fall short on our normally high and enviable standard of care provided at Meadows Court. We at Meadows Court place a strong emphasis on the highest quality service possible for all our service users and strongly believe that no matter how good our present service is, there is always room for improvement. Visits by the General Practitioner are arranged as required and in addition other specialist members of the multi disciplinary team e.g. Social Workers, District Nurses, Occupational therapists, Opticians and Dentists are available and are consulted as required. 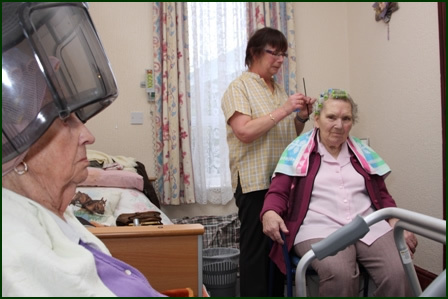 Regular visits to the home are also made by private hairdressing and chiropody services. We maintain links with the local churches and clergy and are happy to liaise and assist with visits from any religious representatives at the request of our Residents and or their families / friends. Meadows Court respects the rights of all our residents to be treated with respect and dignity and to have their own privacy. The staff will always knock before entering any resident’s room and all bedroom doors are lockable to enable residents to keep their personal and private items safe, the resident may have a key to their room. All personal records the home is required to keep about our resident, is kept in a secure place and will only be shared with authorized personnel. Meadows Court Care Home is a Investors In People status care home with a team of highly qualified, experienced and caring members of staff. 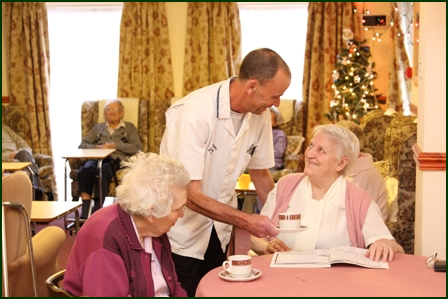 The home employs appropriate numbers of care staff and senior care staff. All staff are carefully selected, screened at interview and checks on suitability made by obtaining references, CVs and also carrying out Criminal Record Bureau and Protection of Vulnerable adults checks, as required by legislations and regulations. The training of staff is very important in respect of providing quality care, and all staff are given regular in service training on top of mandatory training, also encouraged and given the opportunity to complete higher NVQ levels in care. We pride ourselves in the cleanliness throughout the home, which is the result of a full time housekeeper working at the home in ensuring that not only the home is clean and presentable but also all the residents personal clothing is safely and properly cleaned, ironed and repaired when necessary. Our Cook is a fully qualified chef and has several years experience in this profession. All food is freshly prepared daily using fresh local produce, providing a choice of menu with all special dietary needs and personal preferences catered for. Meadows Court employs a Handy Person who is responsible of all the repairs and maintenance throughout the home and its grounds.